Digital Me is now live on BBC Taster. By entering it, you start a conversation with your digital alter ego in the world wide web. The entity that you have been building since you started your online social live is now somehow alive and wants to meet you. What can it tell you about yourself? Will your perception of yourself be influenced by this dialogue? 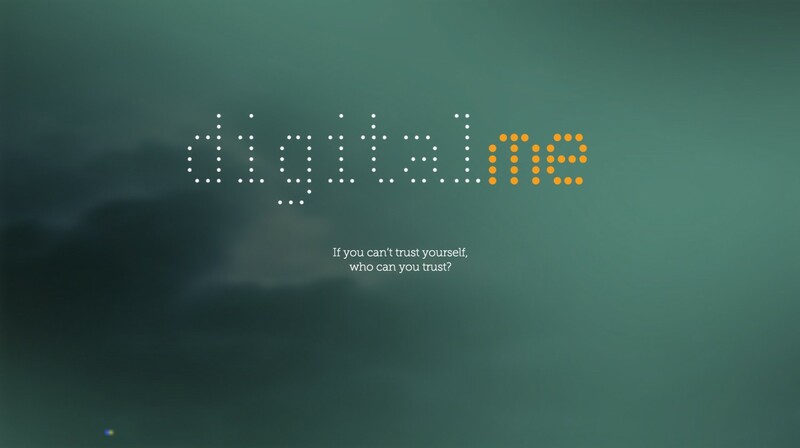 Digital Me is an adventure that started more than a year ago when I got obsessed with the idea of using personalisation to make a story that could speak to each user in a private and meanigful way. 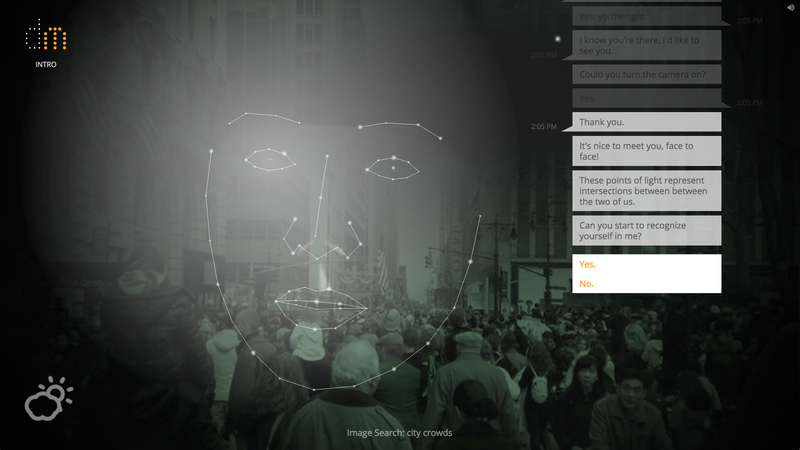 I had seen Take This Lollipop, by Jason Zada, and thought it was very clever, but I somehow felt that using personal data to speak about the self would be more helpful than using it to scare people. How could we use data mining to empower users – rather than to sell them things? And could this narrative be a tool for self-reflection? This is how Digital Me emerged: if we were to use people’s private data it would need to be to reveal more than what current Facebook apps are already doing. More than just counting the number of friends and the “likes” that we have, Digital Me would act as a mirror: it would show us what we do and say online, and it would then ask “are you OK with this?”,”Can you recognise yourself here?”. This is how the idea of creating a dialogue started, it responded to the need of creating a gap, a gap between who we think we are, how we act, and what we show to others. 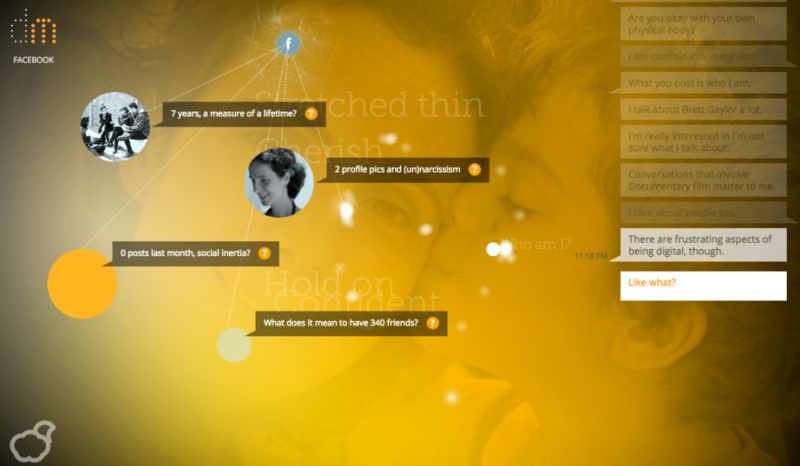 So this is the fundamental idea behind Digital Me: it visualises our online personas by giving them their own agency. They are the ones that want to meet us, they are the ones that initiate the dialogue and, by doing so, they make us realise how hybrid and fragmented our personality is. When I decided to develop the idea I first contacted Berto Yanez, a Spanish friend coder, to check if the concept was feasible. We did a first rudimentary mock up that allowed us to express the idea visually. Thanks to this I applied to Power to the Pixel Forum and to DocFest. But it is only when Mike Robbins, from Helios Design Labs, came on board that the idea really took off. Thanks to his creative expertise we managed to attract the attention of Chris Sizemore (Head of BBC Learning) while attending Sheffield’s Crossover market in June 2014. It then took a while to agree on the practicalities to get some development money in order to create a first working demo for a concept that was, I have to admit, great on paper but quite risky, as all had still to be tested, designed and coded! It took six months to research APIs, data mining protocols, face recognition and other technicalities in order to craft something out of millions of possibilities. The Helios Design Labs team, Jenny Chapman from the BBC and myself would meet via Skype every week and discuss ideas and new developments. Most of the creative work landed on Mike Robbins who acted as a visual poet, an interactive storyteller and a magic coder all together. Slowly slowly, by iterative retouches, we gave life to Digital Me. A little like Mary Shelley and her fictional character Frankenstein, we noticed that the problem in creating our “living entity” was at first philosophical: what can it say? what can it make sense of? Why should it be? We found it difficult select the attributes of Digital Me… if its “raison d’être” was to be more than just a mirror of ourselves, then what is that “more”, and what could it say to interest us? The Digital Me’s script took a long time in shaping, and the version that is on Taster is still just a demo, it is a first attempt that is just asking to get better through the feed-back of its users. (This is actually where you have your role to play! If you try it on Taster, please do fill in the “Give Feedback” form at the end of the experience!). The second question when creating a living entity is “what could it look like”? How tangible should something that is composed by our digital traces be? Is it abstract, recognisable, fluctuating or stable? 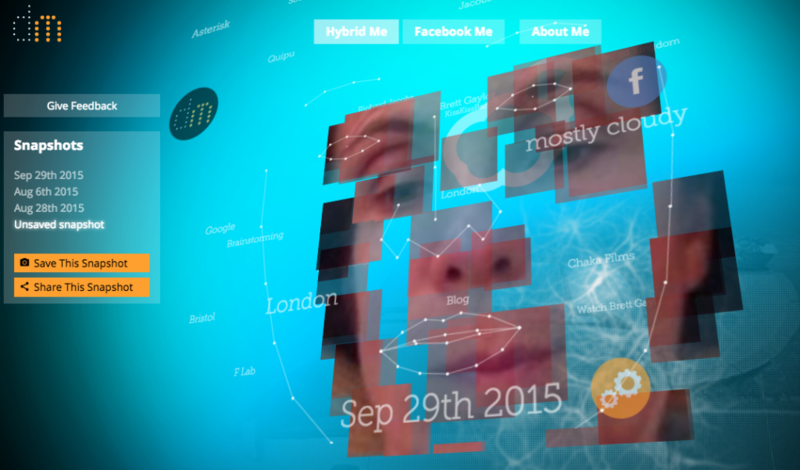 How can a digital entity feel real? This is where designing by code became an evidence. Digital Me took its shape through a series of code sketches that kept changing, but that needed to be coherent with its functionality. No entity in nature is shaped by pure aesthetics. We always have to fit with the ecosystem that guarantees our existence, and it is the same for Digital Me: it is what it needs to be in order to function. If its functionality will change in the future it will have to change too. For now it needs you, the other entities in its ecosystem, to interact with it in order to exist and grow. So… why not go and visit your Digital Me? Through a 10 minutes dialogue you will learn about yourself, about your digital identities and about the coherence (or lack of coherence?) that you accept/orchestrate in your life. And if you vote for it on Taster, and feel our super short feedback form, then you have a chance to give life to Digital Me for real – for now it is just a baby experience, but it could grow to a fully commissioned one if you wanted more from it! Enjoy, and let us know what you think of it. PS: A special thank to Sarah Arruda and to all the people that made it possible for Digital Me to get this far, and my deep gratitude to the whole Helios Design Labs team, to Jenny Chapman and Chris Sizemore for making the last six months feel like a harmonious playground!